I have a short list of brunch dishes that I regularly make. 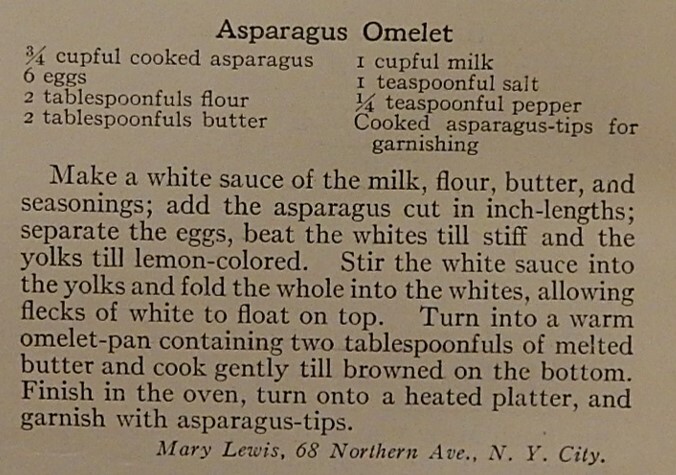 I recently found a recipe in a hundred-year-old issue of Good Housekeeping for Asparagus Omelet that I’m adding to my repertoire of go-to brunch recipes. It makes a stunning presentation, and has a wonderful texture and taste. Often omelets are a little heavy, but Asparagus Omelet is not like the typical modern omelet. The recipe calls for beating egg whites into stiff peaks, and then folding the remainder of the ingredients into them. 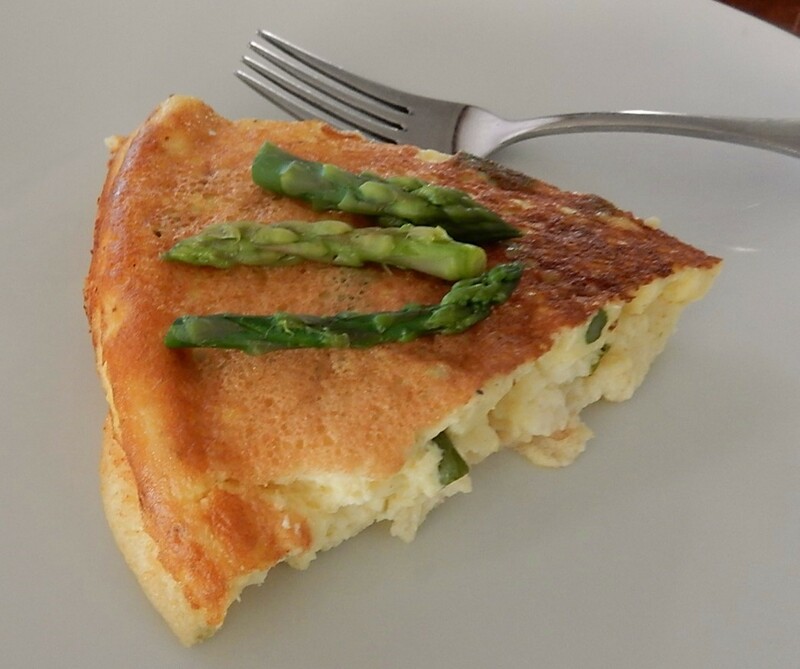 This omelet incredibly light and airy with embedded pieces of asparagus. The omelet was so thick that I didn’t even try to fold it over like the typical omelet, and instead just turned the unfolded omelet onto a plate (actually I turned it onto a baking sheet) and cut into wedges. Preheat oven to 350° F. Make a white sauce by melting the butter in small saucepan, then stir in the flour, salt, and pepper. Add a small amount of milk and make a paste. Gradually add remaining milk while stirring rapidly and continuing to heat. Continue stirring until thickens. Then remove from heat and set aside. In a mixing bowl, beat egg whites until stiff peaks form. In another bowl, beat the egg yolks until lemon colored. Stir in the white sauce and asparagus pieces; then fold into the beaten egg whites. Heat a large oven-proof skillet on the top of the stove using medium-low heat. (If needed to prevent sticking, liberally grease the skillet before heating.) Pour the egg and asparagus mixture into the hot skillet, and gently cook for 1 minute. Move the skillet to the oven, and bake for about 10 minutes or until the egg mixture is set. Remove from oven, and loosen the edges of the omelet from the skillet with a knife or spatula, then turn onto a plate. Garnish with asparagus tips and cut into wedges. Posted on February 28, 2016 February 29, 2016 by SherylPosted in FoodTagged asparagus, eggs, recipe. This is one that I will try! Perfect in a cast iron skillet! 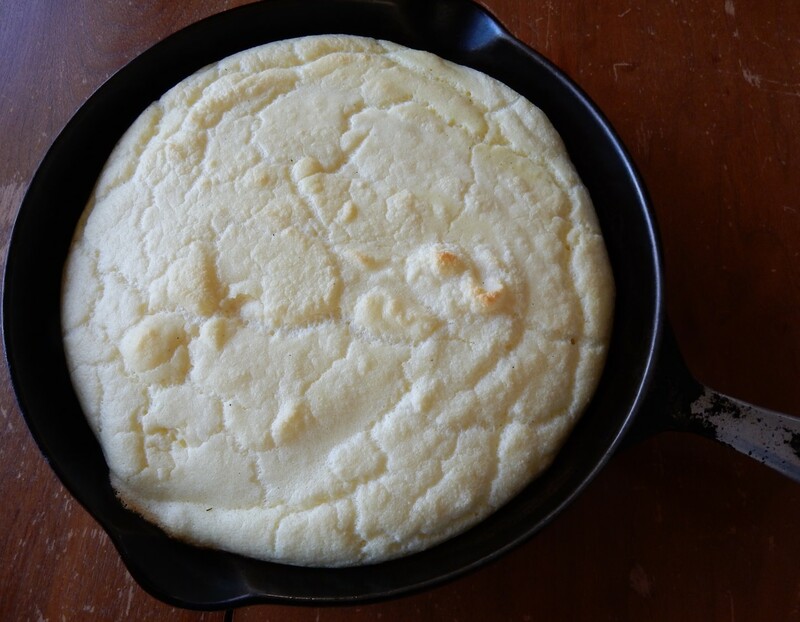 My old cast iron skillet is one of my very favorite pans. It heats so evenly, browns foods nicely, works well on the stove top and in the oven, is easy to clean, etc. It is. I think that you’d like it. Looks good. I’m going to try this soon. It’s very tasty. I think that you’d enjoy it. I like many vegetables, including asparagus, much more now than I did when I was a kid. This would be a nice recipe to try to see if you like asparagus–since the eggs are the predominate flavor with the asparagus adding its delicious subtle flavor and texture. Oh this post is making my taste buds water, I love asparagus. Something I don’t get much of as not many in my family care for it. I know how that goes. There are some foods I seldom make because I know that I am the only person in the family who likes it. That said, this might be a good recipe to get them to try asparagus. 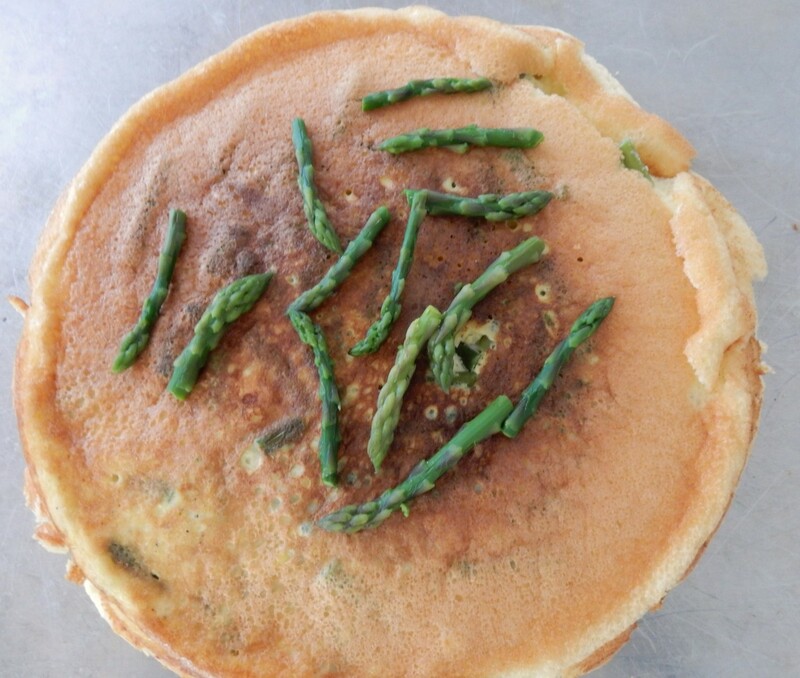 The eggs and asparagus blend together wonderfully to create a very nice taste sensation. Lovely recipe. Beating the whites separately has always been hubby’s secret to getting a fluffy omelet. It’s amazing how much difference beating the whites separately makes. This is the first time I’ve ever done it when making an omelet, and I was very pleased with the outcome. What a find! The recipe sounds delicious. I laughed at my first thought, though, when I read the title and looked at the picture. I wondered why you’d use old asparagus, yet the photo looked so fresh. I know — “old” referred to the recipe, not the asparagus. I won’t forget next time that you are sharing recipes from the past. I look forward to many more. A lovely amazing Seasonal recipe, dear Sheryl! Yummm! The 1st photo sold me this lovely recipe! Ooh yes! I enjoy the seasonal recipes in magazines from a hundred years ago. By necessity, the foods people ate were so much more closely linked to the seasons back then. It looks very delicious. I know I would make sure I got a piece if I was at your brunch table. That looks delicious, and unlike any omelet I’ve ever seen! I’ll have to try this one, thanks! It’s yummy. You’ll have to let us know how it turned out if you make it. Wow I love the texture! It’s beautiful! This will be added to my recipe file! Usually only steam/roast or make creamed asparagus on toast. This recipe is great because the eggs add in protein. This is definitely another nice way to use asparagus. Vintage recipes are great – we like to try them as well. I was just thinking of the whipping of egg white and folding – a lot of people nowadays have probably never even attempted such a thing! I find it interesting that old recipes seem to call for beating egg whites more frequently than more modern ones–yet it would have been much more difficult to beat eggs back then. Most people would have either beaten them by hand or used a hand mixer. inconvenience – because we are so accustomed to convenience! I used to live near a restaurant that made the BEST omelets and I never knew what the secret was! I can see now that they were definitely making them the way you describe here! Beating the egg whites makes a huge difference in the texture. That is one good looking omelet. Beating the egg whites first seems to produce a light fluffy omelet … it looks worth a try. You should try it. I think that you’d like it. Sounds delicious and asparagus season can’t come soon enough! That’s almost souffle like. I love both asparagus and eggs. Until I read your comment, I hadn’t thought about it in quite this way – but you’re absolutely right. It’s almost souffle like. Sheryl, it’s been too long since I’ve found a moment to visit, and I’m so glad that I did. This looks and sounds yummy! Printing and saving! Welcome back! It’s wonderful to hear that you like this recipe. This looks so good! But then, all your recipes look wonderful! It’s yummy! It’s nice to hear that you enjoy the recipes on this blog. I have a lot of fun testing and updating the hundred-year-old recipes.